Born in Brooklyn, New York, Michael Jordan was the third son of James and Delores Jordan, who moved the family to Wilmington, North Carolina when Michael was young. Jordan attended Ogden Elementary School and then Trask Junior High School. Jordan has two older brothers, one older sister, and one younger sister. At Emsley A. Laney High School, he became a better student and a three-sport star in football (at quarterback), baseball, and basketball. Jordan earned a basketball scholarship to the University of North Carolina, where he majored in geography. As a freshman in legendary coach Dean Smith's team-oriented system, Jordan was named ACC Freshman of the Year. He was an exciting if not dominant player, but the Tar Heels were led by All-American and future Hall of Famer James Worthy. 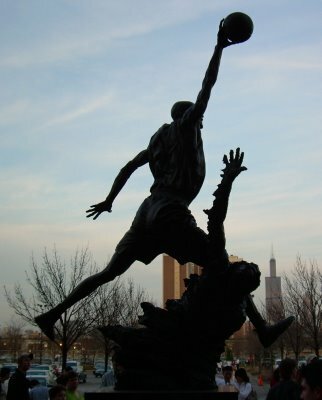 He was also named Rookie of the Year (1985) and Defensive Player of the Year (1988), and won the Finals MVP award every year the Bulls reached the Finals. He also earned the elusive MVP triple crown (regular season, Finals, and All-Star Game) twice, in 1996 and 1998. Only Willis Reed (1970) and Shaquille O'Neal (2000) have won all three MVP awards in the same season (although it can be argued that Bill Russell would also have accomplished the feat, had the Finals MVP been awarded in 1963). In 1997, he also recorded the only triple-double in an All-Star Game.